Billardiera species (including B.scandens, B.Iongiflora): Generally known as apple berries, these are the small, soft, oval fruit of a number of scrambling twiners of dry forests and woodlands. While the flavour is variable, apple seems to be a common component, and the tiny black seeds are reminiscent of Kiwi Fruit. They seem to cope with a wide range of conditions, and some eg. B.cymosa are quite decorative. Podocarpus elatus: Illawarra plum, plum pine, brown pine: A rainforest tree that, left untrimmed, can become quite large. Adaptable to a wide variety of conditions, it does require fairly good soil and moisture to bear well. Both"male and female trees are needed to set fruit. The "fruit" is actually a swollen stem (similar to Exocarpos), and makes beautiful jam and savoury sauces and relishes, which are appearing more frequently in mainstream cuisine. Rubus species (including R.probus, R.parvifolius, R.moluccanus): The native raspberries vary enormously in flavour, even within species, but when they are good, they are very, very good. This is one that would benefit enormously from selective breeding with a view to commercial production as well as the home gardener. Plants are similar to the scrambling prickly canes of the exotic raspberry, though the fruits are generally a brighter scarlet in colour. Syzygium species (including S.paniculatum, S.oleosum and a host of others): Dwarf to large trees bearing small shiny fruit of varying flavour and texture. While frequently rather sour raw, lillipillies make good sweet and savoury preserves. The trees are decorative, with vivid pink or coppery new growth, fluffy flowers and colourful fruit. Selected cultivars are useful as hedges, screens and topiary subjects. Carpobrotus species (including C.glaucescens, C.rossii): Pigfaces or beach bananas are decorative, useful groundcovers in dry, sandy situations, both coastal and inland. As a bonus, they produce a succulent 'salty banana/strawberry/fig tasting' fruit. Tasmannia lanceolata: Mountain pepper: A shrub or small tree of high altitudes, slow to establish and needing regular moisture. The dried berries are used as a condiment, and can really give exotic pepper stiff competition. Becoming more common in mainstream cuisine as well as specialty products. 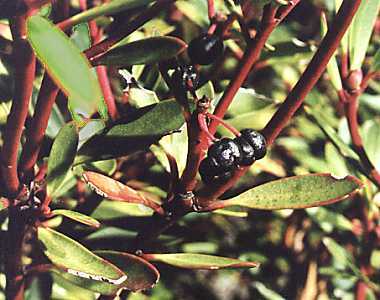 Tasmannia lanceolata: Dried leaves of mountain pepper are used in cooking. Tetragonia tetragonioides: Warrigal greens, New Zealand spinach, Botany Bay greens: The first Australian vegetable to be cultivated overseas, this is a hardy, prolific ground cover producing an abundance of crisp, green arrow-shaped leaves, which must be blanched before eating. Great for the home garden, and in demand at markets, and by restaurants. Grows easily from seeds and cuttings. Apium prostratum: Sea celery or sea parsley: A very popular herb with early sailors and colonists, it has a lot of potential, but has yet to make the mainstream. It likes sun and damp, and tolerates frost. Prostanthera species (including P.incisa, P.rotund!folia) : The mint bushes are fairly hardy shrubs with highly aromatic foliage containing essential oils. Great potential and some commercial interest, but more research needed. Acacia species (including A.melanoxylon, A.sophorae, A.decurrens): The seeds of many are edible, though much work is necessary to realise the commercial potential of most. Certain overseas countries have made greater use of edible Acacia seeds than mainstream Australia. Wattles, which may be small shrubs to large trees, have multiple roles in mixed plantings, and there is also medicinal potential in a number of species. There should te no difficulty finding a number of appropriate Acacia species in any climate, including those which experience heavy frosts. Araucaria bidwillii: Bunya pine grows into a very tall tree which produces excellent timber. The large starchy seeds, usually prepared by cooking, were an Aboriginal staple, eagerly adopted by European settlers, and eaten right up to the present. Microserls lanceolata: Yam daisy, Murnong: Though a staple of Victorian Aborigines, the tubers of this small, dandelion-like herb are not much cultivated, in spite of having been identified early in the period of European settlement as a tasty vegetable. Native lilies and orchids: While the small flowering plants of vanilla, chocolate, fringed and bulbine lilies among others and many ground orchids are beautiful additions to the home garden, their tubers are generally too small and too variable in taste to be a viable food crop. From the April 2007 newsletter of ASGAP's Australian Food Plants Study Group.